1. Enter a keyword in the search box that you can find on the top right of each page. 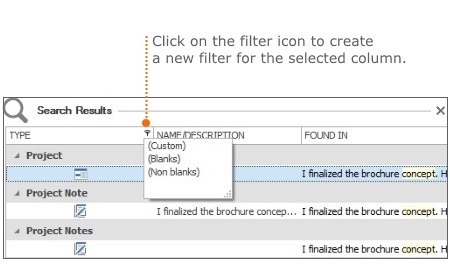 Select All Pages on the search tab to scan all project information. To scan just the open page (e.g. Management, Mindmaps …) click on Only this Page. 2. Select enter or click on the search icon . The search results are shown on the right side of the screen. 3. Additionally, you can refine your search by using a filter on one of the search result columns. 4. 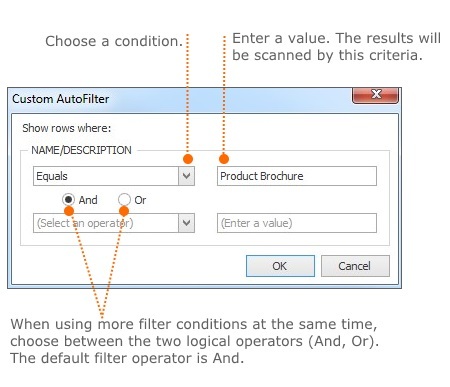 For creating a customized filter you can define values and logical operators in the dialog box. 5. When you are finished click on the discard icon X next to the search results’ list or click on Close Search on the Search tab. Search and filter project information | InLoox 9 for Outlook • Copyright 1999-2019 © InLoox, Inc. All rights reserved.